Hi, my name is Bob Gray, Sr. Please take time to visit iBaptistCollege.org. Over 40 years ago as a married man with a family and a career I left everything and moved my family to Hammond, Indiana, to enroll in Hyles-Anderson College and to study under the ministry of a great man Dr. Jack Hyles as well as Hyles-Anderson College. In those early days of the college a large percentage of the students were older men like me, with families. Today most Bible colleges are filled with young people who are just out of high school. I believe that for them going away to college is a very important and a necessary part of their spiritual development. I support these colleges fully and encourage every young adult to choose and attend one of them with the counsel of their parents and pastor. This program is NOT designed for recent high-school graduates! However there is a void today that no college is adequately filling. That void is providing an education to married men and women who cannot leave and go away, but who feel called to ministry. I have spoken to many pastors and in almost every case they have one or more such men in their churches. Some of these are men who were called, but never were able to go away to college. Some started but for whatever reason never finished. This will help those married men whom their pastor feels would not be in their best spiritual interest to go away to college. God has placed it upon my heart and some other men to begin a college that would help to fill that void. Independent Baptist Online College is a college that is beginning in the fall of 2015 with a goal of training mature men for the gospel ministry under the leadership of their local church pastor. Now you can get a college degree and very soon earn your post graduate degrees through webinar classes taught by seasoned men who have not just learned their subject in a classroom, but lived it in the ministry. This education will be affordable and flexible. It will allow individuals to take classes to further their education or to obtain a college degree. All of this will be under the leadership of the local pastor who knows the student better than anyone. 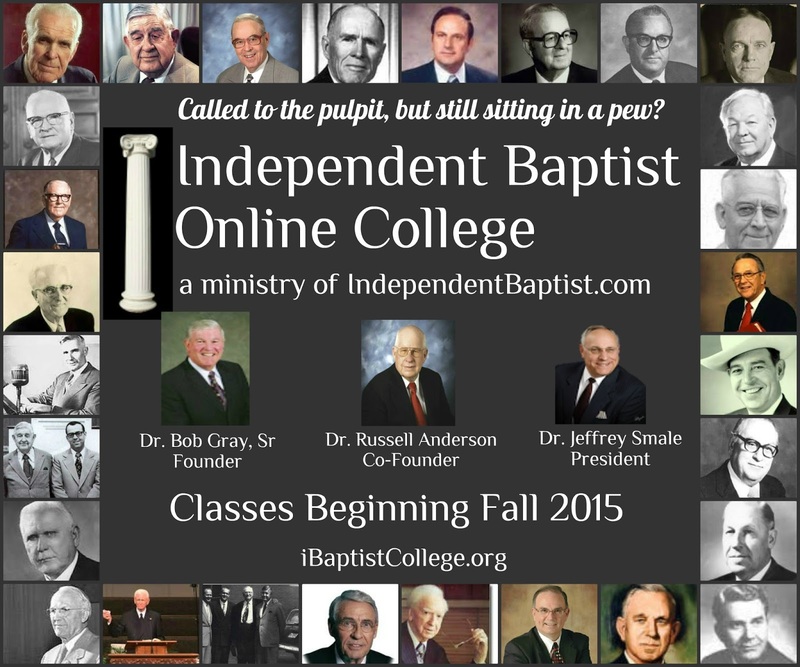 Your local pastor will have to recommend you for Independent Baptist Online College. Thank you for taking time from your schedule to check us out here online. Take some time to see what we are offering and then prayerfully decide if Independent Baptist Online College is for you. We offer a very unique opportunity to start and finish or to finish something that perhaps you already had started. In any case God bless you. Oh, and if you have any questions, feel free to ask.